So whilst the ladies of St Peters trotted off to Jellystone National Park in search of Yogi Bear and Booboo, there was a contingent of St Peter’s male runners off to Tyrone to tackle the Cookstown Half Marathon & 10k courses. A few regulars were posted missing as Dwyer was doing his Judith Chalmers impression and seeing how many countries he could squeeze into the summer holidays (speculation is mounting these trips have been funded by his ‘sideline’ in illegal substances which the Sunday World are about to unveil in their latest sting operation!!) and also not forgetting Eunan, who was off out on his weekly tour of the northern counties in preparation for the Titanic ultra-marathon in September (for all you long distance enthusiasts apparently stopping off at every café or restaurant you pass and having a meal helps with the training for these bigger miles……his garmin recorded he clocked a distance of 20miles in 12hours yesterday, although it’s visible that only 4 hours of those were running whilst the other 8hours were spent on these ‘feeding breaks’ and chatting! Mo Farrah has become an avid observer of this new technique and hopes to put it to use himself when he next decides to do a marathon!). Barry was also absent, as having run 18miles on Saturday, taking in the parkrun, he was stuck at home for his son’s birthday celebrations……but as with Barry he didn’t simply put the feet up, instead he ran 2000 times up and down the stairs ‘just to keep himself ticking over’! Absent too from all the various runs was none other than club ambassador, the ladies chief photographer, the master of disguise, the club’s official cheerleader….yes Mr Skelton, was nowhere to be seen at any of the race venues….I have checked the PSNI arrests over the weekend and to date cannot find his name mentioned; so we’re at a total loss as to where he is and was yesterday. The club has held a whip round, having initially thought about a reward we could offer for his return, but we thought again and raised a lot more money when it was proposed we fund raise and offer the kitty to whoever has him, to keep him firmly under lock and key for the foreseeable future! Anyway forget the Commonwealth games, back to Cookstown and the St Peter’s Elite mens team. The team featured Paul ‘Cheetah’ Cassidy, Paul ‘The Machine’ Mulholland, Colin ‘Cruise-Control’ Conway, John ‘Mile-A-Minute’ McCambridge, Frankie ‘Mutai’ McKay, John ‘Not-So-Slow’ Nix, and Gerard ‘Hell-for-Leather’ Heaney…..a line-up that even Kenya would be proud of! ‘Cheetah’ Cassidy was focused in on the 10k distance whilst the rest of us decided on the larger half marathon distance! It was back to the Tri-Limits crew to organise this year’s event and a new course. The start and finish line was Garden World just outside Cookstown, and the course took in the country roads around the Cookstown area without venturing into the town itself! The route ran out to the mid-point, before simply turning around a cone and returning the exact same route back to the finish line. The course was far from flat, in fact the Cookstown Big Dipper rollercoaster ride passed us runners by on several occasions. Very few of these local half marathons are ever flat but there were more bumps on that course than Vanessa Feltz! Conditions were favourable – I think changeable is the best word to describe them…..we started out in the sun, before a cool breeze accompanied a bit of cloud cover, before the rain started but we’ll settle for that after the heatwave of the previous week. A good pace was set by the race leaders and the boys from St Peters all sat into a comfortable fast pace. First club runner home in the ‘half’ race was John McCambridge showing that despite everything Conor Skelton says about him, that there’s still plenty of life in the ole dog yet. He was followed home by another of Mr Skelton’s targets for abuse, Frankie McKay, closely followed by Gerard Heaney, (the relative new guy in the club), then Paul Mulholland, John Nix and Colin Conway. Everyone posted quite superb times so a big well done to one and all (We will omit the fact that the distance measured almost half a mile short!!!!!! Was Dwyer organising it by any chance???). At this point we must move on to the 10k race and the race of the day. A podium finish is never to be sniffed at, and credit where it’s due as Paul Cassidy came home in third place and into the record books as one of the top 3 in Cookstown 10k 2014! 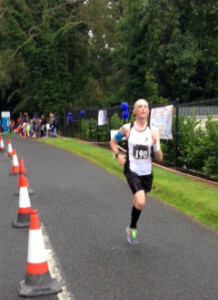 Paul has ran half marathons, the Derry full marathon and now on the back of the Sea2Sky 10k, the Cookstown 10k all in 2014 and his recent runs are showing steady signs of progress so todays finish was well deserved and fully merited. Whilst Paul claimed to be totally shocked by the finish and receipt of the third place trophy, I suspect it wasn’t the total shock he claimed, as he pulled a 26page thankyou speech from his back pocket for the presentation. Indeed he took longer to accept his award and thank those he felt merited a mention (and Nuala and Eunan you were not 2 of the many names listed) than it took most of the half marathon runners to complete the 13.1 miles (well 13.1mile or thereabouts!). Mr Cassidy wasn’t the only person to return home with something other than a medal and commemorative t-shirt, as Paul Mulholland popped into the Garden Centre afterwards and returned home with a rose bush, trellis, and 2 packets of daffodil bulbs! John McCambridge also went home with a pound of Cookstown pork sausages, claiming that they ‘taste different from up there’; and Colin Conway stopped at a local record store to collect his pre-ordered signed copy of ‘Hugo Duncan’s 20 Greatest Hits’ cd! A good day’s outing by all, and coupled with the ladies jaunt around the Alps; Sean Murphy’s run up Divis (was it Divis flats you were running up by the way Sean? 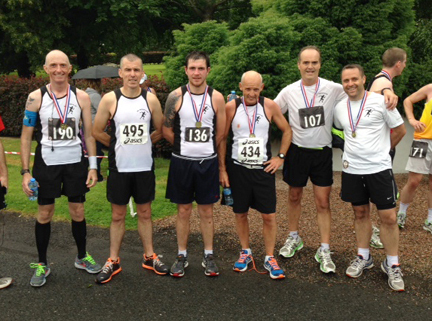 ), and Peter Murrays 1500m run in the All Irelands, the club continues to go from strength to strength.